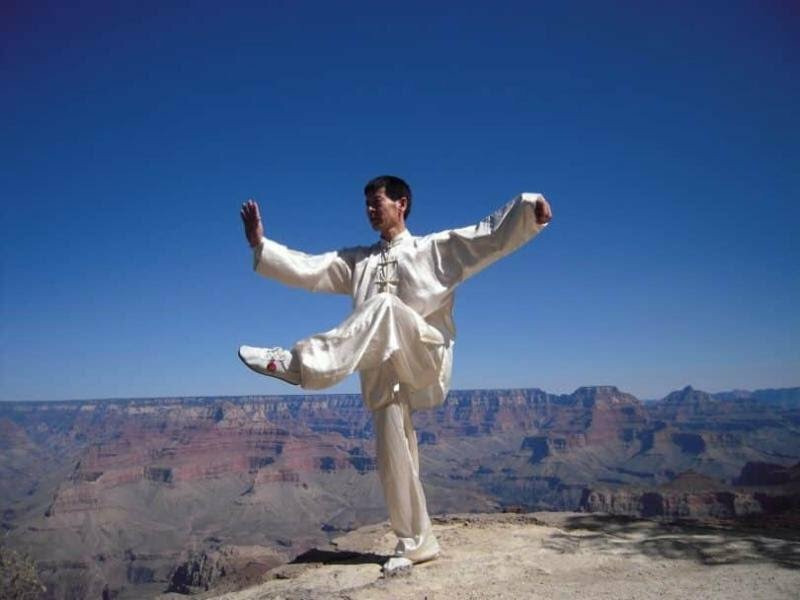 The Wu Dang 13 Posture Tai Chi Form is the original tai chi form created by the Sage Zhang Sanfeng over 700 years ago on Wu Dang Mountain, China. Tai chi may be called “dancing with Spirit.” As we move and breathe and watch and listen, we learn through acts of nondoing just how the Spirit (chi) harmonizes itself within and around the body. There is very little to do. In fact, the less we do, the greater the room for Spirit to heal us and bring us back into balance and wholeness. After all, it is only the mind, the little self, the ego, the personality, that lives in fear and resistance, believing it is separate from Spirit, believing it is separate from the things of the world. As we begin to dance with Spirit, we begin to realize that, not only is it Spirit which animates us and the world around us, we are in fact One with it. There is no separation and can never be. It is not possible. We are the little bush in the yard. We are the bird in the tree. We are the cars passing frantically by. We are anything and everything we could ever imagine. There is only One. Experienced as the two, and the three, and the myriad things, yes, but One nonetheless. Tai Chi and Qi Gong exercises not only balance the physical body, but allow for the balancing of all the bodies; physical, emotional, mental and spiritual. In short; body, mind and Spirit. It is the natural integration of these energies which allows us to more fully experience life. Energy flows more freely. We experience greater creativity and compassion. We begin to prosper and enjoy life, for we begin to see that the world around us is simply us, expressing itself in various ways. I am money. I am my Father, my Mother, my daughter, my son, my husband, my wife. Everything that is presenting itself to me, is me, and simply by being with it, love (the experience of oneness), fills it. The experience of separation (pain) is replaced by the experience of oneness (love). Indeed, I am that. And the world (our experience here) begins to take on new and wonderful dimensions. $135 for 15 Class Card ($9/); Class cards will include Yoga classes (if desired) as well.